Applies to: ONTRAPORT Pro and above. CallLoop allows you to easily add voice broadcasting to your ONTRAPORT campaigns. 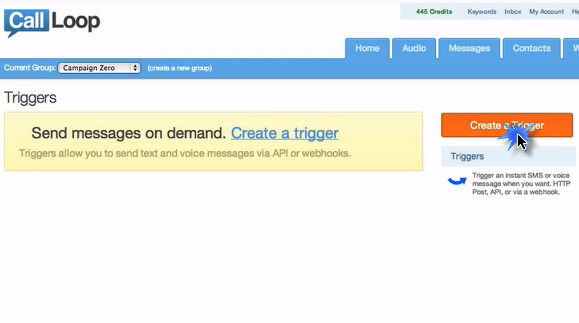 You can send automated phone calls for appointment reminders, announcements and more. CallLoop also offers SMS sending options (but check out ONTRAPORT's built-in SMS feature first). This integration uses a Ping URL to activate a CallLoop campaign for your contacts. The campaign can be triggered via a Rule in a Sequence or on a Smart Form, or by a global Rule. 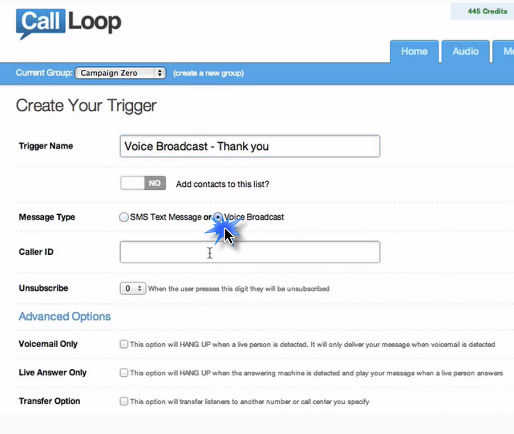 This example uses a CallLoop voice campaign. A similar process is used for the CallLoop SMS features as explained at the end of the Using the Ping URL in ONTRAPORT section. 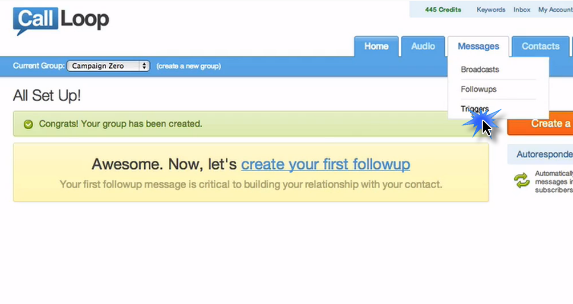 In CallLoop, create a new group. You will not add contacts to this group but it is required to get the Ping URL we need for the integration. Name the group. 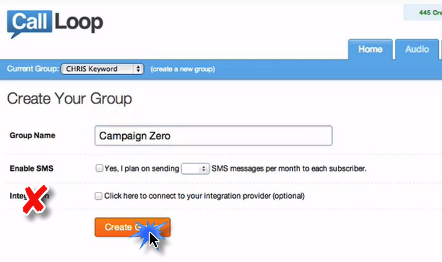 Leave the check boxes for SMS messages and connecting to the integration provider unchecked and click the Create Group button. On the next page, do not create a "follow up". Click the Messages menu item and select Triggers. Click the Create Triggers button. Name the trigger and click the Voice Broadcast option under Message Type. Configure your voice broadcast message according to the instructions provided by CallLoop. 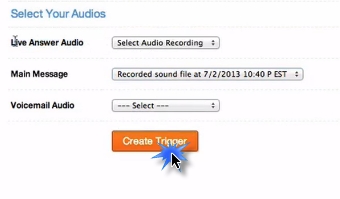 When you are finished configuring the voice broadcast, click the Create Trigger button. On the next page, click the Code button for the trigger you just created. Copy the trigger code from the pop-up box and paste it into a text document for use in ONTRAPORT later. You can always return to this section to obtain the trigger code. It is the Ping URL we will configure in ONTRAPORT. You can use a Ping URL anywhere a Rule is used in ONTRAPORT, in Sequences, on Smart Forms and Order Forms, and in global Rules. No matter where the Rule with the Ping URL is located it will be configured the same way. The steps below show how to configure the Ping URL obtained above in a Step Sequence. Name the Rule and under Then Do This: click Ping a URL. Paste the Trigger Code copied above in How to Obtain the Ping URL into the URL box. Type &phone= into the Post Data box and select the merge field for the telephone number you want to call from the drop down selection. In the example below, we have used the merge field [SMS Number]. Be certain to use the Insert Merge Field drop down to insert the merge fields to ensure they are formatted correctly. Our Rule step is complete! If you decide to use CallLoop SMS instead of ONTRAPORT's built-in SMS support, configure the SMS campaign in CallLoop first and obtain the Ping URL. The Rule uses the same format for the Post Data box with &phone=[SMS Number]. Be sure to select the correct merge field for the number you want the SMS delivered to. 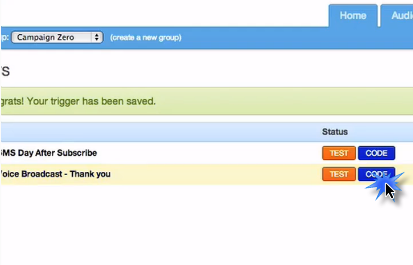 You can also add first and last name fields if your CallLoop SMS includes your recipient's names. The following examples show what would appear in the Post Data box using just the phone number, the phone number plus first name, or the phone number, first name and last name. Q. Where can I get support on configuring the CallLoop campaigns? Q. Does using the Ping URL to send SMS from CallLoop incur SMS charges in ONTRAPORT? A. No, there are no extra charges for using a Ping URL, and all SMS sent from CallLoop are billed by their service. Q. I'm worried about using voice broadcasting in light of my local area's laws about telephone solicitation. Is this legal? A. Contact CallLoop Support; they have the low-down on how to create an effective and legal voice broadcasting campaign!